Within the homeland of the Mescalero Apache lie four sacred mountains. These four mountains represent the direction of everyday life for the Apache people. Tribal elders would often speak of a sacred place called Sierra Blanca. It was there that the creator gave life to the Apache Peoples. It was on Sierra Blanca, according to legend, that White Painted Woman gave birth to two sons, whom she raised to be brave and skilled. Destructive monsters roamed the earth and devastated everything in their path. When these great warriors grew up to be men, they rose up and killed the monsters of the earth. Peace and prosperity spread for all mankind. Wind Rider hopes to pay homage to this sacred site with the Wind Rider Mountain Festival and continue the tradition of peace and prosperity through music and culture. 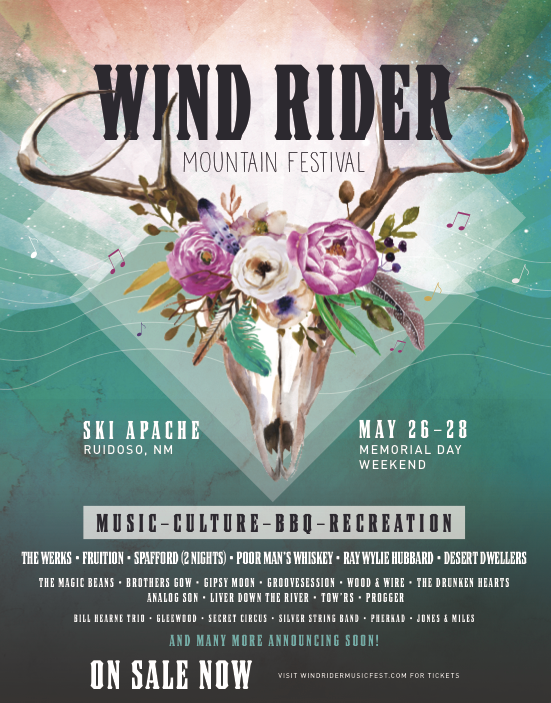 Ski Apache welcomes back the Wind Rider Mountain Festival for the third time in 2017, Memorial Day Weekend May 26-28. Where Music, Culture, BBQ and Recreation collide..this 3 day camping festival boasts 25+ bands on 2 stages where the high mountain air will be filled with the sweet smell of BBQ smoke and the best of Jam, Funk, Bluegrass, Rock, Folk and more. This scenic venue sets at 9,600 feet and will also be home to The Wind Rider Mountain BBQ competition (a Kansas City BBQ Society sanctioned event), downhill mountain biking, zip lining, camping, craft beer, good eats, local vendors and art. Tickets start at $85 for general admission and there are VIP ticket options as well. Campsites are $25 and RV sites are $35 for all three nights of the festival. Email WMF@skiapache.com to become a volunteer! We strongly recommend pre-purchase of tickets which are available on Yapsody, The Inn of the Mountain Gods Box Office and Ski Apache Ticket Sales. This epic event will take place at the base of Ski Apache sprawling across the slopes. Ski Apache is located at 1286 Ski Run Rd. Alto, NM 88312 just 30 minutes from the beautiful mountain resort town Ruidoso, NM. The Lineup features some of our favorites in Rock, Folk, Bluegrass, Funk and more including The Werks, Fruition, two nights of Spafford, Ray Wylie Hubbard, Desert Dwellers, The Magic Beans, Brothers Gow, Gipsy Moon, The Drunken Hearts and so many more. The Wind Rider Mountain BBQ is a sanctioned KCBS (Kansas City BBQ Society) Master Series where some of the best in MidWest BBQ come out and battle for the title of Grand Champion. There is a pot of $9,000 and the festival will be paying the top 10 spots in each category, 3rd Overall, Reserve Grand Champion and Grand Champion. Where else can you go to enjoy world-class BBQ while enjoying some of the best music New Mexico has to offer? Ski Apache will provide full festival passes for up to 4 team members. Additional team members will need to purchase a Wind Rider Mountain Festival pass. The festival is also an official World Food Championship Qualifier and a Jack Daniels Invitational Qualifier! We hope to see you for this sacred gathering of BBQ, Music, Culture and Recreation in just a few short weeks!